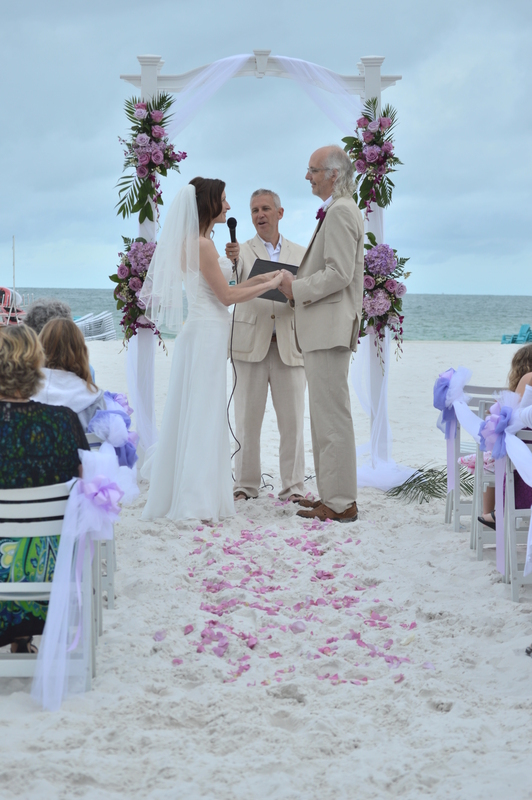 It was a beautiful this past Saturday for Jennifer and John’s early morning wedding at the Hilton Clearwater Beach. After their children were part of the processional, Jennifer made her way across the sand to join John under the wedding arch with the beautiful Gulf of Mexico as their backdrop. There, in an intimate ceremony with family and friends, the couple shared their vows, exchanged rings, and were pronounced husband and wife by Rev. Rick Lackore of Sensational Ceremonies, LLC . Florals and Décor provided by Marsha with Marsha Marie Floral; Wedding Photography by Laura Chapin of Laura Chapin Photography; Sand Sculpture by Sanding Ovations; Wedding Coordination by Lainey Dunn with Confetti Events; and Venue Coordination by Senior Catering Manager, Melissa Rowjohn and her staff at the Hilton Clearwater Beach. This picture was provided by Tammy Lackore. Congatulations to the new Mr. and Mrs. John King!